Animated under the musical leadership of Lyric’s music director, Andrew Davis, and marvelously sung by a theatrically savvy cast of characters, this brand-new “Rheingold” bristles with the vitality and wit imprinted on a design conceived by the late South African Johan Engels and brought to fruition by British designer Robert Innes Hopkins. The narrative of “Das Rheingold, which plays out in a single act running some two and a half hours, serves as expository prologue to the three ensuing operas that form Wagner’s grand parable. Those latter chapters – “Die Walküre,” “Siegfried” and “Götterdämmerung” – also will come up in new productions over the next three seasons, ending in 2020 with the Lyric’s complete turn through all four operas of the “Ring” cycle. 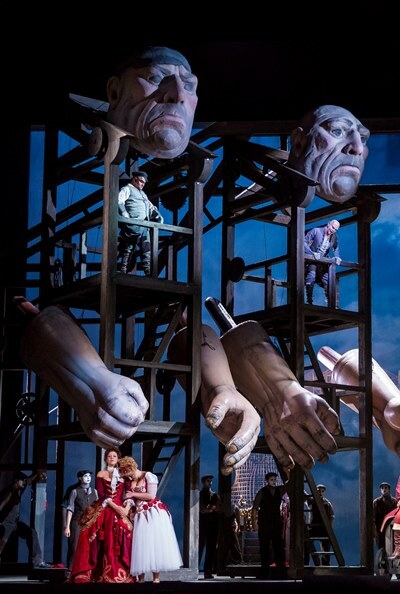 While the “Ring” may be hallowed turf to many Wagner zealots, even as it has been freighted with portentous symbolism by sundry directors, this “Rheingold” mix of whimsical set design and free-wheeling stage direction by David Pountney suggests we’re in for some welcome light, and with it some profound illumination as well. Here, Wagner’s take on the Norse gods of the “Nibelungen” saga holds up a clear mirror to humanity in all its frailty, imperfections, lust, greed and, well, bad planning. Wotan, chief of the gods, has commissioned two giants to build a majestic citadel, Valhalla, as a proper residence worthy of these immortal 1-percenters. Problem is, when the big guys come to collect their promised reward – the goddess Freia, whose golden apples nourish the gods’ perpetuity – Wotan refuses, insisting they name some other price. But the giants are adamant; they will have only Freia. The conflict soon leads to a curse, then a vainglorious quest and ultimately the fall of Valhalla and of the gods themselves. But all that is for the next three seasons. The Lyric’s “Rheingold” begins in bewitching fashion, with three old crones – not unlike the three weird sisters in Shakespeare’s “Macbeth” – dragging to empty center stage (the cosmic void, before the earth existed) a suitcase from which they pull the blue sky itself and the rippling waters of the Rhine: all this accompanied by the orchestra’s grumbly invocation of chaos, which steadily blossoms into a joyous musical image of idyllic bliss – and the three Rhinemaidens, who guard the cache of magical gold from which an all-powerful ring can be forged, but only by one who forswears love to attain unassailable dominion. Lyric’s Rhinemaidens — soprano Diana Newman and mezzo-sopranos Annie Rosen and Lindsay Ammann — display vocal treasures worthy of their golden hoard. It’s hardly exaggeration to say these three agile, bright and ample voices set the evening’s standard. And it is quickly met by bass-baritone Samuel Youn’s Alberich, the repulsive dwarf whose failure to win the Rhinemaidens’ affections prompts him to swear off love forever and go for the glitter. But not before the three damsels, elevated on movie-camera dollies operated in full view by stage crew and actors, have roundly taunted the lusty gnome in a kind of aerial ballet, soaring and swooping about the miserable object of their amusement. A scene shift, to the idle gods waiting for the giants to finish their castle, only widens the horizon of splendid singing. 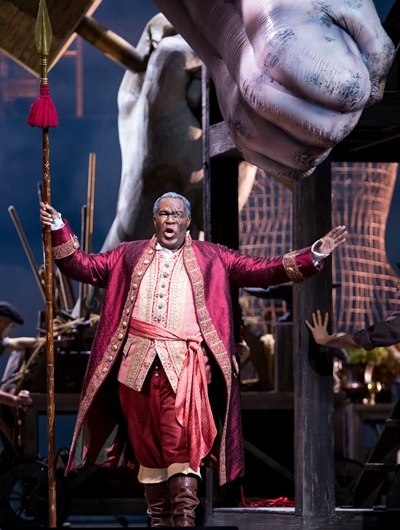 Bass-baritone Eric Owens, in his role debut as a rather world-weary Wotan, displayed a beautiful upper register to complement an expressive middle range. And mezzo-soprano Tanja Ariane Baumgartner, as Wotan’s long-suffering wife Fricka, offered a gorgeous performance well deserving of the stormy ovation that greeted her curtain call. 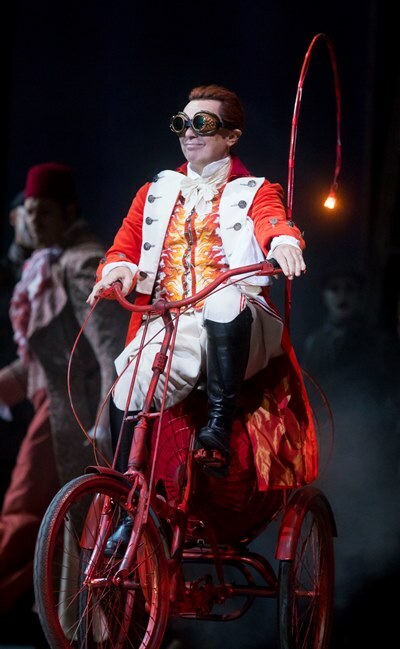 Tenor Štefan Margita, as Wotan’s calculating sidekick Loge, zooming onto the scene on a fiery red three-wheeler, added both mordant comedy and stunning vocal means. On the other side of that coin, on the night’s most somber note, German mezzo-soprano Okka von der Damerau, unfurling a dark and resonant sound, made an impressive American operatic debut as Erda, the prescient goddess who warns Wotan to give up the accursed ring he has wrung from hapless Alberich. In the end, Wotan must relinquish all the gold he has stolen from Alberich, including the ring, to pay off the giants and rescue Freia. 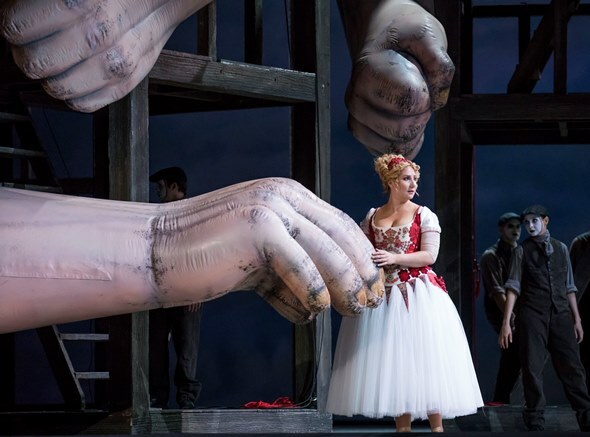 In this reading of the story, however, sweet Freia (soprano Laura Wilde) seemed to have played Fay Wray to the giant Fasolt’s King Kong in a very happy night together; she was visibly disinclined to leave the comfort of his supersize hand. The giants are, well, big – in the form of two tremendous towers topped by huge heads, with imposing hands and arms to match. Within these structures stood basses Wilhelm Schwinghammer (Fasolt) and Tobias Kehrer (Fafner), giving virile voice to these grandiose caricatures. 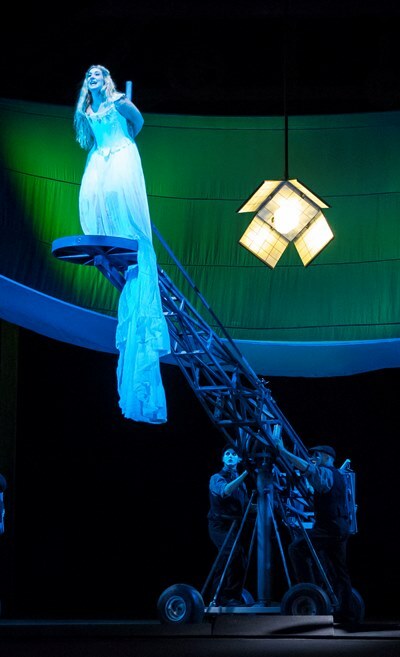 The Lyric’s fantastical “Rheingold” must be a costumer’s dream, and Marie-Jeanne Lecca has let her imagination run with it. The whole affair is a visual riot – up to, but not including, the corner-cutting make-do Valhalla, which perhaps too proudly replicates the Lyric’s “Aida”-inspired fire curtain. Nor does the stringy rainbow bridge leading to this clapboard castle look like something you’d want to set foot upon. But never mind. The fun is in the journey to that footbridge. It’s a terrific night for Wagnerites.